All costs are per person based on two people sharing a double/twin room. Please note that, in line with Norwegian hotel regulations, there is a supplement for single occupancy of both single and double rooms. Costs exclude flights, train transfer to Vinstra and personal insurance. Included are ski instruction, full board accommodation, ski rental (if required) and mini-bus transfer from/to the hotel/station. Costs of accommodation and ski rental have been made at a rate of NOK 10.00/£. Fluctuations in the exchange rate will affect the £Stirling price quoted here and in all our written material. Flights and rail transfers are paid for by clients (on line) at the time of booking. Clients pay their hotel bills, which will include their ski equipment rental bills and any coach/minibus transfer charges from/to stations, at the end of their holiday. No deposit is required for accommodation, coach/minibus transfers or ski rental. A hard copy of these details is contained in our Information Pack, which is available on request or on receipt of a Booking Form and deposit. The Nordic Challenge fee for tuition and guiding: £380.00. Paid direct to Nordic Challenge UK Ltd. Ski rental charge (where applicable), paid to the hotel: £70.00 (£110.00 telemark equipment). Exact rental charges to be confirmed at the beginning of the 2019 season. Transfer from Vinstra station - Wadahl Hotel (return) £24.00 (Children under18 £12.00). Included in the hotel bill. Accommodation costs are based on two people sharing a double or twin en-suite room. Single supplement. NB. In line with Norwegian hotel regulations, a single supplement is charged for single occupancy of any accommodation. This may seem strange to our UK clients, but this is how it is in Norway. The single supplement is: £18pppn. Panorama rooms (south facing) are available for a supplement of £14pppn. Children 16-17 years - 25% discount. The ski rental charge is included in the overall cost of the holiday, and will be itemised on your hotel bill. It covers the cost of one set of Nordic skis, poles and boots (or Telemark equivalent) only. The rental of additional sets of equipment will incur an extra charge. Ski lift pass for Telemark skiing. 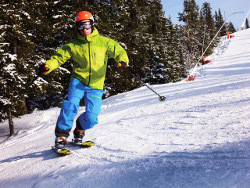 The price of the lift pass for the Telemark skiing course is not included in the overall cost of the holiday/course. NB. Updates on vacancies, and any amendments to this programme, will be notified on this web page.